New for September 2014! Steve D. from Maury Microwave provided the content below that explains the color-connect scheme. Thanks! We all know of engineers and technicians who have at times been unsure whether two adapters mated, whether cable assemblies could be connected and what torque wrench to use. With this uncertainty comes an underlying fear of damaging equipment, reducing measurement accuracy and wasting precious time. If only these interconnects, which are so similar, could be easily labeled and identified. John Bies of Redstone Arsenal certainly did; he lobbied for the establishment of a “standardized method to rapidly identify high frequency coaxial connectors.” His report included a short list of possible results from misidentifying connectors and attempting to mate two incompatible connectors, including damaged equipment, degraded equipment reliability, degraded performance, degraded mission readiness, increased maintenance time, increased maintenance actions and lost efficiency. Additionally, even if two connectors could mate, their operational frequencies might differ, as is the case with mechanically compatible 3.5mm and 2.92mm connectors where the highest common operational frequency may only be 26.5 GHz. Bies went on to state that the benefits of color-coding high frequency coaxial connectors would include the elimination of damage to equipment, a greater confidence in connector identification and use, a financial saving in training time and costs (he estimated $5.8 million and 5000 man-hours per year in the U.S. military/government agencies alone), an increase in efficiency, reliability and readiness and an improvement in personnel safety. An Institute of Electrical and Electronics Engineers (IEEE) Coaxial Connector Rapid ID Working Group was established in June 2008 and a proposed color code scheme was developed in August 2008. The IEEE project authorization request P1802 was submitted for review in January 2009 and approved in May 2009. The working group is now referred to as IEEE P287 with mandate to review the 287-2007 standards for coaxial connectors. With no other reason than selecting a familiar color scheme known to engineers across the globe, the standard resistor color-code BBROYGBVGW was proposed for high frequency coaxial connectors (increasing resistor value compared to increasing frequency) and is shown in Figure 1. ColorConnect Precision Adapters from Maury Microwave are currently the only commercially available adapters to employ the IEEE working group color-coding scheme. These adapters offer improved VSWR specifications bridging the gap between calibration-grade metrology adapters and daily-use lab adapters. Compensated beads maintain an accurate 50 ohm transmission line for improved VSWR performance. Compensated female contacts extend the usable lifetime to more than 500 matings. Critical pin-depth and position-tolerance prevents performance degradation (due to “gapfit”) and component damage (due to “interference-fit”). Inner and outer conductor’s finish and materials ensure high conductivity with reduced signal loss. Mating surface flatness and finish minimizes signal loss. Orbital consistency and concentricity ensure proper alignment and best repeatability. ColorConnect Precision Adapters are available in SMA, Type N, 3.5mm, 2.92mm, 2.4mm and 1.85mm in-series and between-series and are selectively shown in Figure 2. Cable assemblies are used in a wide range of applications and by a user-base with varying degrees of experience and training. As with the adapters, how can one be certain that the cable assembly about to be connected is in fact compatible, and that damage to both the assembly and system will not occur? 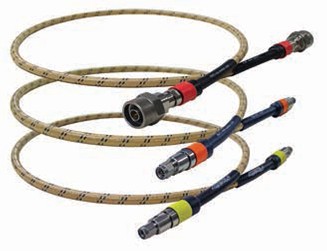 Listening to its customers, Maury implemented its ColorConnect color- coding to its Stability line of cable assemblies. Designed specifically for phase-stable and amplitude-stable applications, Stability offers excellent measurement repeatability even after cable flexure. With a ruggedized, durable construction, Stability will outperform other typical assemblies resulting in a reduced total cost-of-test. Stability’s light weight, flexibility and small form-factor make it ideal for daily use with VNAs, test instruments, bench-top testing and ATE systems. Stability assemblies are offered with 2.92mm connectors to 40 GHz, 3.5mm connectors to 26.5 GHz and Type N connectors to 18 GHz, and have respectable insertion losses of 0.84, 0.67 and 0.54 dB/foot, respectively (at Fmax). Designed specifically for phase- and amplitude-stability, these assemblies offer a typical phase-stability after bending of 5, 3.5 and 2 degrees, respectively, and an amplitude-stability after bending of 0.05, 0.02 and 0.0015 dB, respectively. Phase stability with temperature is less than 4°/m/GHz between –55° and +125°C. Stability achieves a crush by employing additional ruggedizing layers, including a crush protection layer, a braided strength member and braided outer jacket. The assemblies have a minimum bend radius of 1 inch (25.4 mm) making it flexible and versatile. With a flex lifecycle over 20,000, Stability offers one of the lowest cost-of-ownership of most any phase-stable assembly. 2.92mm, 3.5mm and Type N color-coded Stability Cable Assemblies are shown in Figure 3. ColorConnect Precision Adapters and Stability cable assemblies have been specifically designed so that the color identification bands are visible when connected, making identification and verification simple without the need to disconnect any piece of the interconnect chain. Most, if not all, 5/16"-hex high frequency connectors look similar from the outside but vary greatly in performance and design. Sub-Miniature version A (SMA) connectors use a polytetrafluoroethylene (PTFE) dielectric which contacts along the mating plane, that along with the variances in design and construction can cause mating uncertainties and introduce a possible air gap. Because of the possible variances in materials used (i.e., brass versus stainless steel) and the possibility of the thin outer wall (conventional SMA design), it is generally accepted that SMA connectors require a torque value of 5 in-lb in order to limit possible damage. Other 5/16" hex high-frequency connectors implement an air-dielectric and are named after the diameter of said dielectric; 3.5mm, 2.92mm, 2.4mm and 1.85mm. 3.5mm and 2.92mm employ center pins of equal size and are thereby mechanically mateable, along with the SMA. However, due to the design and specifications of the connector which includes a stronger wall (0.021 inches in the case of the male versions), 8 in-lb torqueing is recommended. With a common 5/16" hex interface, how does one tell the difference between 5 in-lb torque wrenches designed for SMA connectors, and 8 in-lb wrenches designed for the rest? Maury offered a color-coded handle, black for 5 in-lb and blue for 8 in-lb, but it was often confusing to remember which was which. 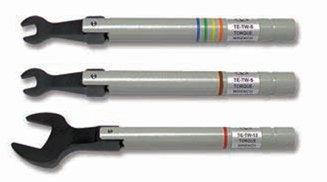 Maury’s new line of TW series torque wrenches employ color-banded handles, with the 5 in-lb handle striped with a brown band, and the 8 in-lb handle striped with orange, yellow, green and blue stripes, as shown in Figure 4. TW-series wrenches employ a “break” design making it difficult to over-torque a coupled junction. Each torque wrench is factory preset to the proper in-lbs value and have a variance of ± 10 percent. With its high quality, low cost and color code, engineers can match up the paint stripes on the wrench handle with the color bands on the ColorConnect adapters and Stability cable assemblies and be guaranteed a proper torque each and every time.